The Australian Horror Writers Association has announced the finalists for the 2012 Australian Shadow Awards, and what a great list it is! Lots of friends on there, and I am particularly delighted to see my mentor, Jason Fischer, listed. 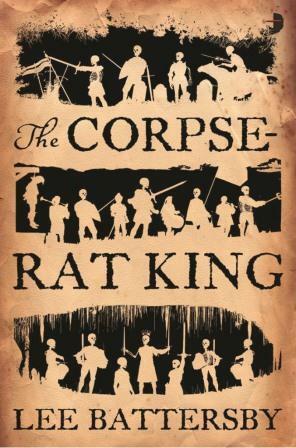 And, The Corpse Rat King is a book whose success I have followed with interest as I was one of the beta readers. This entry was posted in Writing and tagged Australian Shadows Awards, awards, Lee Battersby on March 23, 2013 by David. Lee Battersby is the author of the novels ‘The Corpse-Rat King’ (Angry Robot, 2012) and ‘Marching Dead’ (Angry Robot, 2013) as well as over 70 stories in Australia, the US and Europe, with appearances in markets as “Year’s Best Fantasy & Horror”, “Year’s Best Australian SF & F”, and “Writers of the Future”. A collection of his work, entitled “Through Soft Air” has been published by Prime Books. He’s taught at Clarion South and developed and delivered a six-week “Writing the SF Short Story” course for the Australian Writers Marketplace. His work has been praised for its consistent attention to voice and narrative muscle, and has resulted in a number of awards including the Aurealis, Australian Shadows and Australia SF ‘Ditmar’ gongs. He lives in Mandurah, Western Australia, with his wife, writer Lyn Battersby and an increasingly weird mob of kids. He is sadly obsessed with Lego, Nottingham Forest football club, dinosaurs, the Goon Show and Daleks. He’s been a stand-up comic, tennis coach, cartoonist, poet, and tax officer in previous times, and he currently works as the Arts Co-ordinator for a local council, where he gets to play with artists all day. All in all, life is pretty good. This year you had some very exciting news, landing a book deal with Angry Robot (congratulations!). As someone who was already a multiple award winning and prolific writer, do you feel that this recognition has changed your profile or your approach to writing? It’s definitely changed my approach to writing in one very simple but central way: I’m a novelist now. That probably sounds a bit flippant, but the whole texture of my life has changed recently, including a day job promotion to a co-ordinator position that really eats my days. I have very little time left over for writing, so what time I have has to be devoted to one task, whereas in the past I could skip from one project to the other on a whim. Right now, I’m exclusively focused on novels because I have to be: time just doesn’t allow me to do anything else, and I’m on contract, so I have to cut away everything bar the novel work for a while. As to my profile, I don’t know– I’ve been slowly sliding into the background over the last few years, and not being so prolific at magazine level hasn’t helped. Perhaps the promo splash of a novel release will bring me back into peoples’ thinking for a short while, but as long as the work stands up and satisfies people, that’s the important thing, not whether I get recognised at Cons. Looking back at your time as editor of various publications, are there any writers whose current success you predicted, or ones that we should still be keeping an eye out for? I’m not much of a prophet. I remember tutoring Peter Ball and Jason Fischer at Clarion South 5 years ago or so and feeling that they were likely to go on and do some impressive things, but there were several others from that class who I felt could do the same, and have done so in different guises, notably Chris Green and Laura Goodin. I’m not currently as involved in mentoring and teaching as I have been in the past, or as I’d like to be, so I’ve not got much of an idea of who’s at the grass roots level waiting to break out. Being surprised by a new voice is part of the fun, though, so it’ll be interesting. I think there are a number of authors who are now stepping up to full time novel production who could go a long way– I’d keep my eye on Joanne Anderton and Trent Jamieson, for two. Are there further adventures planned in the world of “The Corpse-Rat King”, or do you plan on moving on to new projects once it and its immediate sequel are complete? I’m contracted for 2 novels, which is standard Angry Robot practice, but there is a clause allowing for a third novel if they so wish, and I’ve got the story arc planned right through to the end of that third novel. The novels are designed to be stand-alones as much as possible, so if we only see two on the shelves it won’t lessen anything. But it feels good to have an extra story in reserve. I’ve also been asked to write a Marius Helles short story for a magazine, so there will probably be one short as well. But I’m easy– I love playing in the world of the Corpse-Rat King, but I’m 52K into a Father Muerte novel and have a couple of others in the early planning stages, including a post-apocalyptic revenger’s tragedy, so whatever comes along it’ll be fun to write. I feel guilty, because every time we do a snapshot I get asked this question, and every time I say “I’ve not been reading many Australians”, so I end up feeling like the least supportive guy in the world! I do read, and bloody well enjoy, Midnight Echo when it comes out, and I’m currently partway through Joanne Anderton’s fantastic debut novel ‘Debris’. I have Deb Biancotti’s ‘Bad Power’ and Trent Jamieson’s ‘Roil’ on my to-read list, but God knows when I’ll get to them. My current day job– I’m the Arts Co-ordinator for a City of 120 000 people– is eating my life, and by the time I get home, play with the kids, spend some time with my wife, do my own writing work…. reading is well on the back burner for the moment. But nobody needs my recommendations: go to a Con or an independent book store with a hundred bucks, plonk it on the counter, and demand Australian things. You’ll get a mad selection, if nothing else. I don’t know. It’s hard to tell. Everything I’ve ever heard about Aussiecon in 1999 led me to believe there would be a seismic shift in the way we do things, but Aussiecon 4 doesn’t seem to have had any real impact at all. Maybe I’m just too divorced from the scene at the moment to see it, but apart from increased discussion about electronic publishing, which seemed to be on the rise anyway, I haven’t really seen anything massive taking place. I’m not be the best person to ask, though: the story of my journey over the last 3 years seems to be a slow parting of the ways with the intense, involved world of the Australian SF small press scene, which saddens me somewhat because that’s where I keep all my friends (although the friendships remain) and where I’ve had some of the best times of my life over the years. But the scene changes, and evolves, and something new will always arise. It’s the nature of the beast. I think we’re going to have the best small press publisher in the country come out of that scene in the next couple of years, and that’s going to be worth watching. This entry was posted in Writing and tagged 2012snapshot, interviews, Lee Battersby on June 3, 2012 by David.